See why it's called Blue Ridge? 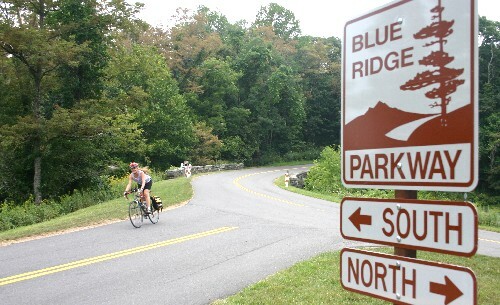 At 74 years old, our beloved Blue Ridge Parkway has its problems. But it is still a glorious 469-mile joy ride along the Appalachian Mountains, from Virginia to North Carolina. Next year, during the 75th-anniversary hoopla, there will be the usual long list of media events and celebrations, but the best way to appreciate the Parkway is in silence from an overlook or during a hike or, for Wessel and me, a bike ride. Though Wessel and I are woefully out of shape, with me sitting on my derriere in the car half the summer while researching “Farm Fresh North Carolina,” we rose to the challenge. And I do mean rose. 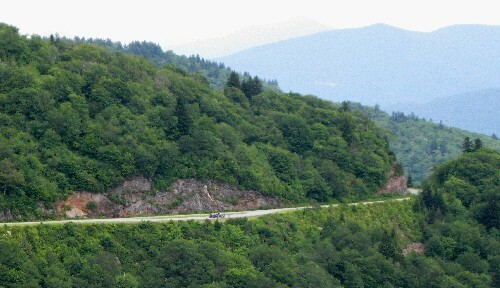 During only 20 miles of riding, we climbed a total of 2,900 feet! I’m glad I hadn’t known that ahead of time. The only thing I insisted on, because I did know from our elevation map in “Bicycling the Blue Ridge” that this would be a grueling-up and screaming-down ride, with no in between, was that we would end the ride going down. That’s just a little obsession of mine. It was July Fourth, and the weather was perfect. Surprisingly, the car traffic was very low. As always, the “other” biker traffic was quite high, as the Parkway is a magnet for motorcyclists. Only at the end of our ride did we see other bicyclists. 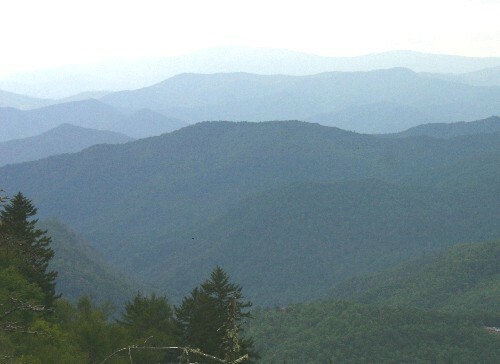 The highest peak we reached was Waterrock Knob Overlook at 5,718 ft (milepost 451.2). 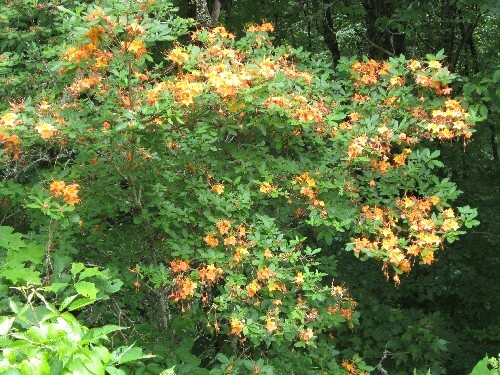 We could have walked half a mile to the summit lookout, at 6,400 feet, but we didn’t want to tax our legs even further. Wessel and I still have a lot of ground to cover on the Parkway. We’ve ridden 274 miles on it, but that’s always up and back, so we’ve explored only 137 miles on our bikes. Here’s to the next 332! This entry was posted on July 23, 2009 at 8:22 am and is filed under Bicycling, Environmental, North Carolina, Road travel, US/Canada national parks, Virginia. You can follow any responses to this entry through the RSS 2.0 feed. You can leave a response, or trackback from your own site. Hey, we’ll need to start at opposite ends and meet in the middle! What say you? A real where they went story. Challenging !